J. “Scott” Nooney founded Nooney & Roberts and is the firm’s managing partner. Scott continues to command the firm’s personal injury practice and leads the team of five attorneys. Scott ensures the daily operations of the firm are attended to with special attention. 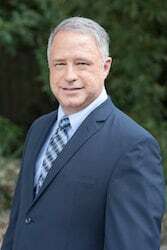 He began his legal career as an Assistant State Attorney for the 4th Judicial Circuit where he prosecuted misdemeanor, felony offenses, and juvenile cases from 1987 until 1991. Following his time at the State Attorney’s Office, Scott furthered his career in private practice with a few firms in the Jacksonville area. In 1997, Scott founded J. Scott Nooney & Associates and in 2004, he joined with Michael Roberts to form what is now the Law Office of Nooney & Roberts. Scott was born in Jacksonville, Florida and is a 4th generation Jacksonville native. He earned his undergraduate degree from Florida State University in 1984 and later earned his Juris Doctor from Florida State University in 1987. Scott resides in San Marco with his lovely wife, Erin. Scott and Erin have three children, Jeff, Caroline and Hank. In his free time, he is an active member with the Church of Our Savior Episcopal, spends time with his family and friends, enjoys traveling to the Blue Ridge Mountains in North Carolina, and watching Seminole football. Go Noles!